Cramps can be so painful – uncomfortable for days at a time – and even debilitating for those women prone to severe cramping. Many of us ladies retain a significant amount of water before and after their menstrual cycle, which is one of the reasons why bloating and cramping occurs. And regardless of if you are facing period cramps or not, it is important to drink plenty of water as a part of your daily diet. While you are experiencing cramps, the amount of water you drink should actually increase to help combat the pain. 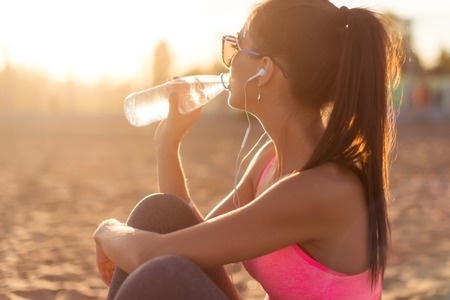 During your period, experts say you should drink ten eight-ounce glasses of water each day. But when it comes to drinking this much water, you are bound to grow tired of the bland taste. To help make your water a bit tastier, there are a few natural substances you can add in. Peppermint is a well-known remedy for helping menstrual cramps, because it is both a muscle relaxer and appetite suppressor. You can make a great peppermint tea in fall or winter to warm you up and boost your water intake. 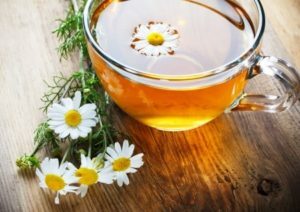 Another tea we love is chamomile tea. This tea contains a natural anti-inflammatory, which reduces the prostaglandin production and relieves menstrual cramps. The hot water in teas will also help in relieving your cramped muscles by increasing blood flow to the skin. Trying to find another way to intake water? Snack on some water-based foods like celery, watermelon, cucumber, berries and lettuce. The next time your cycle arrives, or you know it is on the way, start drinking a few extra glasses of water each day. Think about it this way; the more water you can take in, the lighter your cramps should be throughout course of the week. And of course, for all-natural relief from your reduced period cramps, try using Comforté.